Urban development has been structuring itself around a new concept lately: mobility. Mobility isn't just about how easy it is to get out of your neighborhood, but also about what's in your neighborhood. Can you walk out of your home and walk to a grocery store, a shop, or a bar? Space is something that cities can't take for granted — the more dense metropolises become, the more we're forced to manage how we construct our homes, shops, and recreational areas. Even though retail has found a huge market in online shoppers, foot traffic can be just as important to maintaining a strong business. Let's look at Barcelona's "superblocks" — it's like a piazza, but bigger. The idea came about when the city had to construct a plan to combat pollution and congestion, ultimately landing on an innovative solution that would create a haven for humans. With only small vehicles driving through at 10MPH, the multi-block area is open to street vendors, local retailers, entertainers, and pop-up markets. Parking is kept underground, so every little bit of surface in the superblock is utilized. 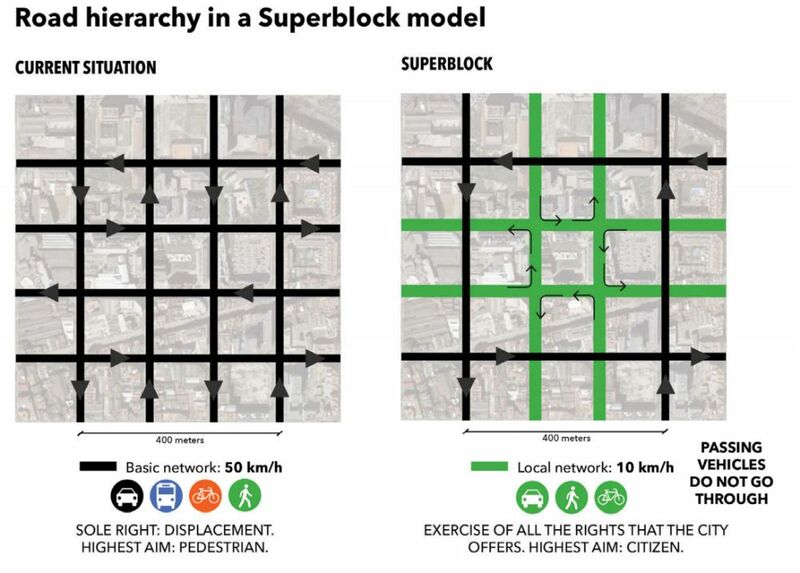 Barcelona has been implementing superblocks since 2008, nearly doubling the amount of pedestrian space in the designated areas. They found that limiting car access didn't decrease economic activity (as some believed it would), but actually increase it. What's key to the success of these superblocks is that they create a communal meeting space that's accessible and enjoyable. But, we have to ask an important question: can this idea be implemented in America? The superblocks were simple to design because the city was constructed as a repetitive grid, with almost every block mimicking the other. The issue with many American cities is that they're built around car access, meaning that we have hundreds of streets crisscrossing over one another, disrupting any clearly defined grids. But, we're working around these obstacles. Tontine Cresent in Boston was designed to become a meeting space for pedestrians, eliminating car traffic and decreasing pollution in the immediate area. Not only does redesigning street and curb space allow for more businesses to exist, but it also brings retailers closer to their customers. People can live within these blocks, putting us above or next to vendors and in turn, the vendors become part of the community and overall identity. Think about having a Sunday morning coffee shop that you can relax in, or that little convenience store around the corner where you grab last minute items before friends come over. All of these things become more feasible when you can safely and easily live, shop, sleep and even work all within a couple of blocks.